In 1977, DC and Marvel were in dire straits. Rising costs for paper and printing were driving up costs even as readership seemed to be declining. Some people were predicting the end of the American comics industry. But DC had a plan. That plan became known as the “DC Explosion.” Essentially, DC decided to try to drive up sales by releasing a bunch of new titles and increasing the number of story pages in each title, accompanied by a price increase. Some books stayed at 35 cents, but others went up to 50, and the company also introduced a line called Dollar Comics which are pretty self-explanatory. 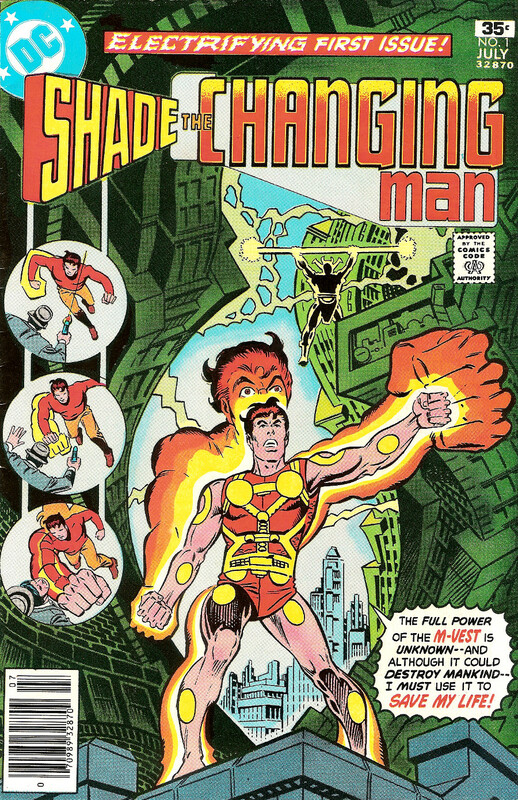 Among the new titles were Black Lightning, Steel: The Indestructible Man, Claw the Unconquered, Firestorm, the Nuclear Man, and Shade, the Changing Man (yes, whoever was in charge of titles needed to get out more). 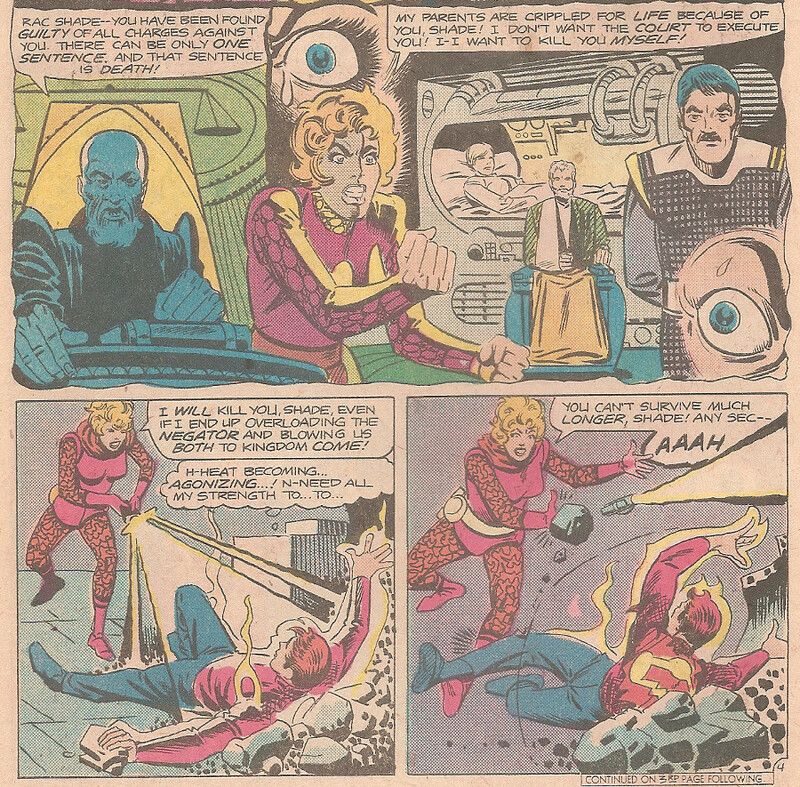 Shade #1 came out in April or May of 1977, and it was not like anything else the company was doing at the time, although in another sense, it was. 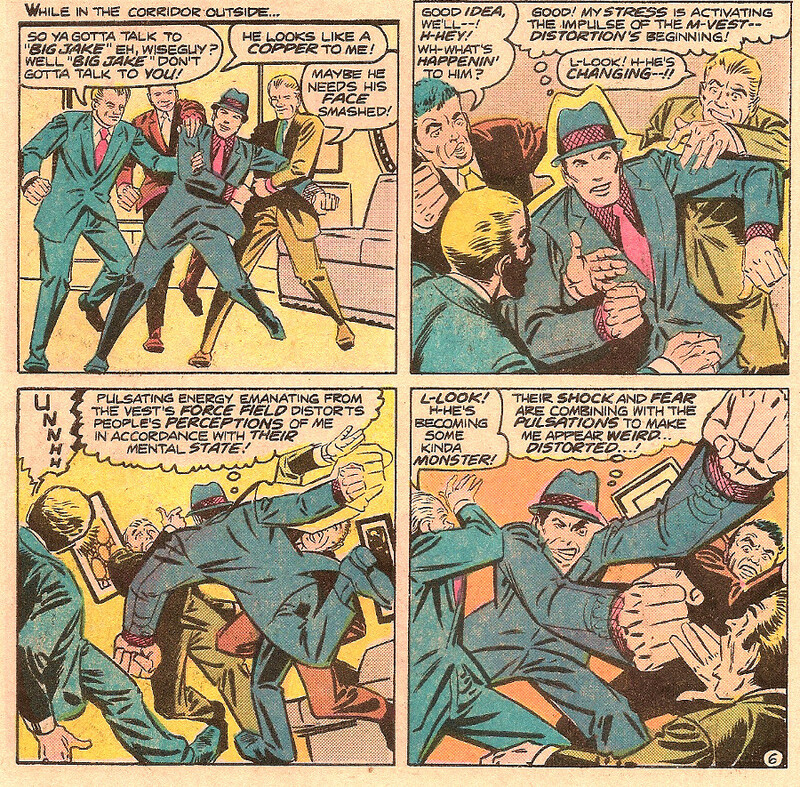 Shade was the work of Steve Ditko, best known for being the original artist on Marvel’s The Amazing Spider-Man (and co-author as well; although he didn’t write the dialogue, there seems ample evidence that Ditko did most of the plotting on the book). The title was extra-unusual in that it played out like a superhero title, but it bore no connection to the greater DC Universe. Unlike, say, Firestorm, there were no early Superman or Batman cameos to try to drive sales. This was Ditko’s show all the way (although Michael Fleisher was credited with writing the dialogue). The biggest similarity to other DC books was the fact that it was a distinctive work by one of the biggest names in the business. DC was doing a lot of that at the time, with oddball books by Joe Simon (co-creator of Captain America) and Joe Kubert, and Jack Kirby had only recently left DC and returned to Marvel as well. The premise of the book was wacky: part science-fiction, part Doctor Strange. The book features two parallel universes, or “zones,” which certain people can travel between at will. The Earth Zone is our familiar world. However, the Meta Zone is a futuristic world populated by bizarre villains with fantastic powers provided by near-magical super-science and pursued by Science Police. Between the two zones lies the mysterious Zero Zone, with an Area of Madness that will destroy anyone foolish enough to enter. Rac Shade, a disgraced former policeman (and the only known survivor of the Area of Madness), gets caught up in a mass breakout from a maximum security prison and ends up in the Zero Zone. Alone among the prisoners, he has a special implant which allows him to go to Earth, where he formerly worked as a secret agent. Once in his apartment, he dons the “illegal M-Vest” and sets out to clear his name. Turns out he was framed by his former boss, who had made himself a bit of a crimelord on Earth. So Shade tries to infiltrate the gang, and we get our first look at the M-Vest in action. The vest produces a a force field which not only protects Shade from harm, but also produces illusions based on the stress and fear of the people Shade is fighting. It doesn’t make a huge difference in the fights, but it looks cool as hell. So for eight issues, Shade battled foes like The Form and The Cloak and Khaos, Lord of Destruction, all the while being pursued by Mellu, his former partner and lover. She bears a grudge against Shade. As the issues progress, Mellu begins to doubt Shade’s guilt, although she is still sworn to arrest him and let him be tried in court. Meanwhile, Shade is drawing closer to the conspiracy that had him framed, Meta’s dreaded Crime Council, headed by the bizarre Sude (or Supreme Decider). And in an ironic twist, it turns out that Sude is actually one of Mellu’s crippled parents. I say “ironic,” because rumor had it that the reason Ditko left Spider-Man was over a dispute about the Green Goblin’s identity (Ditko wanted it to be someone anonymous, unknown to the hero, because having it be someone he was well acquainted with was too much of a coincidence). Yet here was Ditko once again doing a story where the mysterious master villain was the parent of someone close to our hero (the Green Goblin story has since been debunked). Which turned out to be prophetic. In fact, issue 9 was never released except as part of a photocopied “ash can” issue titled Cancelled Comic Cavalcade. Shade was cancelled along with over SIXTY other series in what came to be known as the “DC Implosion.” And I, for one, was disappointed. Although the book was kind of hokey and old-fashioned in an industry on the verge of huge changes, it was exciting and action-packed. I was surprised, when I went back to reread those old issues, at just how well the series still holds up, as opposed to, say, Chris Claremont’s X-Men, which I loved and which I now find almost unreadable. 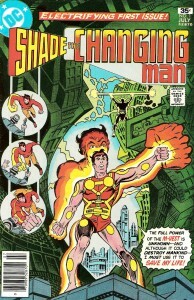 But Shade, the Changing Man did make a comeback of sorts, in 1990, although he was greatly, um, changed. More on that next week. 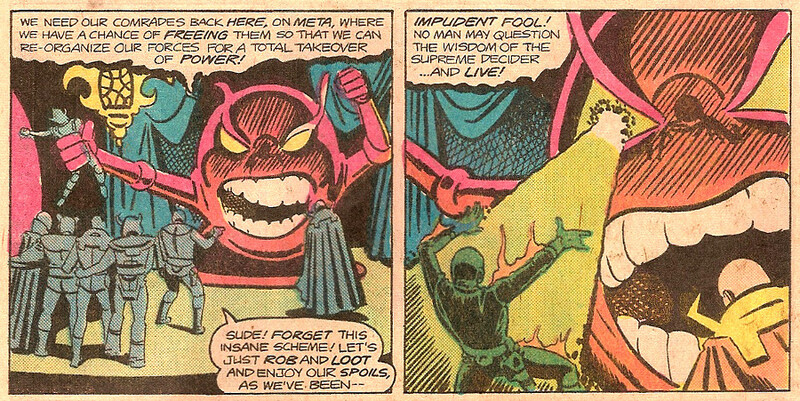 This entry was posted in posts and tagged comics, Shade, Steve Ditko, superhero. Bookmark the permalink.